Join me this winter in an organized camp or create your own private ski adventure. If you are interested in private guiding or unique destination ski experiences please email chris@steepskiing.com and let’s make your dreams come true. 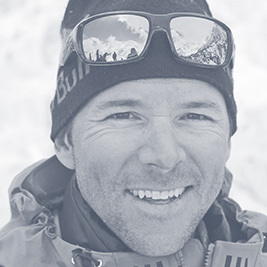 Aspen, CO. (November 7, 2018) — Professional skier, guide, and camp operator Chris Davenport is proud to announce the dates for the sixteenth annual Superstars Ski Camp at Ski Portillo, Chile. The camp will take place August 17-24, 2019. The Portillo Superstars Camp is geared toward advanced skiers who are looking to take their skiing skills to the next level with expert coaching from some of the world’s top professional freeskiers including returning coaches Mike Douglas, Cody Townsend, Ingrid Backstrom, Wendy Fisher, and Chris Davenport. Chris’s two sons — Stian and Topher, both scholarship athletes at Hodlerness School in Vermont — will be involved as assistant coaches and Jesse Hoffman and Cooper Campisi will be on hand documenting the week with videos and photos. Coaches and campers will work on all aspects of skiing including, powder, corn snow, steeps, terrain management, decision making, risk management, snow safety, technique, style, climbing, traversing, and generally trying to produce a better all-around skier. The camp operates in small groups each day and campers rotate through the coaches so each camper gets to ski with each coach during the week. Coaches present each night with slideshows, Q & A sessions, and videos and the entire week is very social. Sitting on the banks of the beautiful Laguna del Inca, Hotel Portillo is surrounded by terrain that beckons skiers from all over the world. Attendees of the Superstars Camp find wide-open powder fields with untracked powder, technical chutes carved into the Andes, a variety of rocks to jump off for skiers looking to log some air time, and pristine lines accessed by short hikes. With the Superstar coaches passing along tips and advice, all of Portillo’s famed terrain opens up to attendees of the camp. The cost of the camp is US$2975 and includes seven days coaching and activities both on and off the hill, including exclusive presentations by the professional staff, a world-class gift bag, and images and video of each client’s skiing highlights. Note that the Hotel Portillo ski week (including seven nights accommodation, eight days lift tickets, four meals daily, and access to all the Hotel’s amenities, start at US $3400 per person in the grand Hotel Portillo and US $1900 at the Octagon Lodge with meals being an additional cost. For more information, visit www.chrisdavenport.com or check out Chris Davenport’s Superstar Camp Facebook page. To book this amazing skiing experience, guests should first book a Ski Week at Ski Portillo with the reservations department, reservas@skiportillo.com / daniela@skiportillo.com, online at www.skiportillo.com or call US Toll Free 1-800-829-5325. The Saturday to Saturday, seven-day ski week includes accommodations, lift tickets, four daily meals and access to our facilities. After getting a hotel confirmation, please email Chris Davenport at chris@steepskiing.com to confirm your place in the camp. Please do not hesitate to email Chris with any additional questions. For more than 60 years, Ski Portillo has seamlessly united the spectacular beauty of the Chilean Andes, the pure joy of skiing and snowboarding, the camaraderie of friends and family, and the resort’s unique brand of hospitality and service, delivering unforgettable vacation experiences where guests create the memories of a lifetime. For more information or to book a Portillo vacation, visit www.skiportillo.com or email reservas@skiportillo.com or call toll-free from North America, 1.800.829.5325.